Las Vegas (the Meadows or grassland) was a name given by the Spaniards who used water in the area while heading north and west along the Old Spanish Trail from Texas. In the 1800.s areas of Las Vegas Valley contained artesian wells that supported extensive green areas or meadows.John Freemont travelled into the valley in 1844 when it was still part of Mexico. He was a leader of a group of scientists, scouts and observers for the U S Army Corps.In 1855 following the annexation to the U S, Brigham Young sent 30 Mormon missionaries to convert the Paiuti Indian population. A fort was built near the current down town area, serving as a stopover for travellers between Salt Lake City and a colony at San Bernardino, California.Las Vegas established itself as a railroad town in 1905 when 110 acres were sold off. Paris Las Vegas Resort and Casino is located on the Las Vegas Strip .It opened in 1999, is operated by Harrah's Entertainment and has 2915 rooms. It includes a half size replica of the Eiffel Tower, a two thirds size Arc de Triomphe and a neon sign in the shape of the Montgolfier balloon. The Paris is linked to its sister property, Bally's Las Vegas by a promenade. Originally, the Eiffel Tower copy was intended to be a full scale replica but this was not possible due to the close proximity of McCarran International Airport. You can take elevators to the top of the tower, which is nearly fifty storeys above the ground. As Paris Las Vegas is located on the heart of the Strip you have great views from the observation deck which stands at 460 feet. 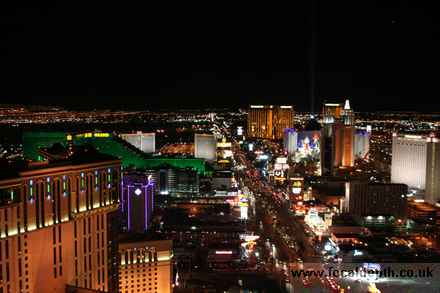 In particular, the night time views of the city and the Bellagio Fountains are brilliant.